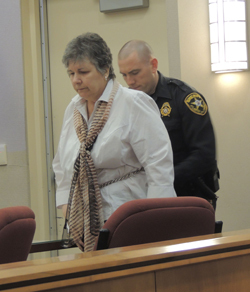 Loretta Doyle Burroughs, 63, of Mays Landing, New Jersey, is accused of murdering her husband, Daniel Burroughs, in 2007. “This defendant killed her husband in cold blood, eviscerated his corpse and placed him in Tupperware to rot for seven years,” said Seth Levy, Atlantic County chief assistant prosecutor, in his opening statement. Photos of the remains were shown to the jury last week. Donna Andersen, covering the trial for the Daily Mail, obtained exclusive photos of the remains. EXCLUSIVE: Photos of dismembered body parts positioned on a white sheet shown to horrified jurors as woman stands trial for stabbing her husband, chopping him up in pieces and then storing them in Tupperware containers, on DailyMail.co.uk. This woman does not sound like a psychopath but a woman who just freaked out and went berzerk. Are we this desperate to prove women psychopaths exist? Perhaps she was stressed by his behavior, but she planned the disposal of the body in a non freaked out calculating way. If she was able to do that, she probably was able to escape the relationship without committing a gruesome murder. Normal people don’t usually have the capacity to chop up a human body the way she did. It’s also worth considering that ‘just freaking out and going crazy’ is a category of excuse for behavior choices that is often used by abusers. There’s no way to discern for sure what her mental state is, but her behavior shows signs of psychopathy. Delores – She was found guilty yesterday, and I’ve written another story for the DailyMail, which will be published soon. This woman carefully planned the murder plot. She forged a power of attorney so she could sell the house and keep the profit. What the jury did not know was that she had already done time for embezzlement and her previous husband also died mysteriously. In my opinion, Loretta Burroughs is certainly a psychopath. She certainly acts like one. Donna, so frightening. What scares me is that we trust our spouse, yet they could be our murderer. A few months ago I found out my partner of 22 years has lied to me the whole time about who/what he really is. How can we trust again when we experience that….or read about murders like this? I honestly feel terrified of the world or there when I was so trusting before. It’s wonderfully written Donna albeit horrific to read. Thank you for sharing.